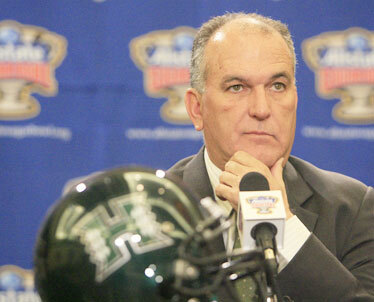 June Jones pondered a question during yesterday's news conference, his final interview session before today's game. NEW ORLEANS » It's a question June Jones hopes is still viable after tonight's Sugar Bowl. The Hawaii coach was asked if the Warriors should be voted No. 1 in the nation if they beat Georgia and complete an undefeated season. "Ask me that after the game," Jones said. "We're here, we're happy to be here and we'll play hard." Jones, attired spiffily in a charcoal gray suit, seemed to not mind a bit being grilled one final time by reporters a day before the most significant sports event in Hawaii history. He was at ease and answered questions he'd been asked dozens of times before with patience. Regardless of tonight's outcome, Hawaii fans just hope Jones puts the suit away again, and doesn't wear it to job interviews. His contract expires in the offseason, and reports persist that his agent, Leigh Steinberg, is in negotiations with SMU. With practices, meetings, planning and public appearances, Jones hasn't had much time to think about his future, much less relish what has been going on around him. Hundreds of Hawaii fans crowd the hotel lobby and thousands more party nightly on Bourbon Street. "I will appreciate it more when I get through this game," Jones said. "I haven't had a minute to feel gratification." "I did not get to see the pep rally," said Jones, who lowered his guesstimation of last week that 35,000 Hawaii fans would be in the Superdome to between 25,000 and 30,000. "There are so many transplanted Hawaiians on the mainland who go unaccounted for," Jones said.